The first passenger version of the Boeing 747-8, the 747-8 Intercontinental, took to the air for the first time today from a chilly and windy Paine Field in Everett, Wash., in front of thousands of Boeing employees, company managers and media. The largest passenger airplane ever built by Boeing took off at about 9:58 a.m. local time, in sunny conditions, and flew to the north, climbed to 5,000 feet before heading west over the Olympic Peninsula, by which time 747-8 chief pilot Mark Feuerstein and copilot Paul Stemer officially had begun flight-test program duties. 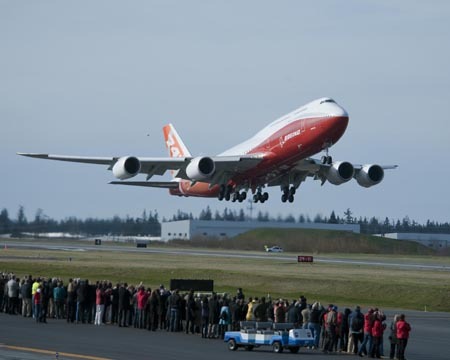 The airplane touched down four hours and 25 minutes later at Boeing Field in Seattle. During the flight, it reached an altitude of 19,000 feet and a top speed of 288 miles per hour (250 knots). Painted in a new reddish-orange “sunrise” livery, the 747-8 fuselage measures 250 feet, 2 inches in length–18 feet, 4 inches longer than the 747-400. The stretch allows for another 51 seats, raising passenger capacity to 467 in a typical three-class configuration. The airplane also offers 26 percent more cargo volume. The 747-8 Intercontinental features a new GEnx-2B engines, a new wing design, an updated flight deck and an interior that incorporates features from the 787 Dreamliner. Since the program’s launch, Boeing has secured several modest orders for the cargo version of the airplane, but had experienced less success marketing the passenger variant. To date, the company has secured firm orders for 25 Intercontinentals from Lufthansa and Korean Air. It has also sold eight VIP-configured Intercontinentals. All told, it holds firm orders for 109 of the four-engine airplanes, including 76 of the 747-8F freighter. On the same day, Boeing successfully completed high-speed taxi tests on the first airplane, scheduled to go to a VIP customer. During the testing, the airplane reached a top speed of approximately 90 knots (103 mph, 167 kph), and the pilots lifted the nose gear from the pavement. Boeing received clearance to post orders for some 200 airliners from China during an official state visit by Chinese president Hu Jintao in January.